For the past three years, Janine has worked full time in the Diving Industry, teaching PADI courses and spending three days per week at sea on one of Cairns premium learn to dive liveaboard vessels. In the following article, she shares, tongue in cheek, some of her experiences and a typical week in the life of a full time PADI Diving Instructor. If I had collected $10 from every customer that has commented, “you must have the best job in the world?”, then, I would be a rich woman. Certainly, at times, I agree, it is the best job in the world. Then again, I have the benefit of having lead another life. Previous to diving full time, I worked as an accountant for 12 years. Even after a bad day on the reef, I often think, at least I wasn’t stuck in an office until midnight, stressing about some ridiculous deadline or, having sleepless nights about spreadsheets and corporate politics. Then again, diving full time has its stresses and challenges too. So what does the best job in the world entail? Well, a typical week for me goes something like this…. Each Thursday (which is my Monday!) starts at 06.30 which is my only sleep in of my working week! My very smart uniform, freshly laundered and pressed is donned. My boss is very strict on all staff looking smart, clean-shaven (for the guys that is! ), hair neat and tidy, shirt tucked in with belt worn, closed toe shoes, tattoos covered (or preferably not there!) and name tags worn. A far cry from the stereotypical image many dive instructors seem to have! After arriving at the Training Centre, I get onto planning the week ahead, printing off class lists, boat training schedules, bus pick ups and classroom set up, all prior to jumping in mini bus to collect my Openwater students for the week. By 08.30, all students have been picked up and checked in and the fun begins! 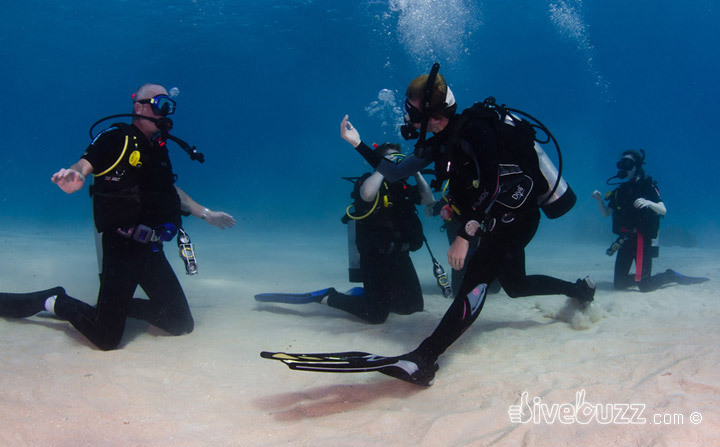 In Queensland, legislation dictates that all Open Water students must have a current dive medical conducted in accordance with the Australian Standard AS 4005.1 prior to commencing the course and all students are informed of this on booking. At this stage however, my question of “Do you have a dive medical yet?” always seems to cause a few issues. Responses vary from “I don’t know” to a blank look. I change my questioning to “have you been to see the Dive Doctor yet?” Still no clear response. I give them a medical form to fill out and hope for the best. I pass around the lunch order form and promptly get asked “if I don’t have any lunch with me do I have to order lunch?” I bite by lip and respond that they do need to order lunch if they want to eat and add that it is going to be a long day without any food. I run through all the paperwork that they are required to fill out and stress that everything needs to be completed before we break for lunch. At this stage, the two German lawyers sat on the front row question the liability release form. I state that it is a standard PADI liability release that they must sign if they want to complete the course. They refuse to do so, so I walk them to the office for a course refund. The first two days of the course are spent at the Training Centre, and time is split into watching the PADI DVD’s, me presenting the prescriptive lesson guide slides, completing quizzes and exams and, of course, the confined water training in the pool. Lunchtime comes around quickly, the Dive Doctor arrives and any students who had not previously completed their dive medical (or can still not remember if they have) complete their medical whilst eating lunch. After spending the entire morning talking about diving and how wonderful it is, it is often hard on anyone who fails the medical at this stage. I have consoled many grown men, crying in the corner after failing their medical. Of course, the Dive Doctor has failed them for good reason and it is in their best interests. On one such instance, a guy still stormed off and informed me that he will go and do his course in Thailand where no such requirement exists! We usually have large groups each day and so will split the group into two teams for the pool and ocean portions of the course. Everyone needs to be allocated a BCD, wetsuit, fins, weight belt and mask/snorkel prior to the pool session. This should be a simple task, however, at least half of the holidaymakers do not seem to know what shoe size they are? By 14.00 I have finally jumped in the pool, first to check that everyone can swim by completing a 300 metre snorkel test. At this stage, I will soon realise that the person who advised me in the classroom this morning that they could not swim was not lying! Some people still want to continue and I often find that they can pass the swim test later in the ocean with the added buoyancy of salt water, so I do not get overly excited at this stage. Others will head straight away to the office for their day one course refund, which they are entitled to with this particular Dive Centre. Some still come out with us on the boat , but as snorkelers. I often ponder what an interesting move this is for someone who cannot swim. During the 10 minute float exercise we will do another round of introductions, primarily to help me remember everyone’s name. Name, where are you from, favorite food, favorite drink and what people would like to see on the reef are my normal questions. I try to stop myself from getting on my moralistic high horse when the majority of people say that they love seafood but cannot resist by planting a few seeds on sustainable seafood. I am passionate about the ocean and protecting its wonders and see it as my role to educate the people that I engage with via diving. Every little helps I suppose, it just needs to be done in the right way so as not to be seen as preaching. Following the swim tests, we are gearing up and getting ready to jump in. At this stage, I always ask everyone to take a trip to the bathroom, as we will be in the pool for the rest of the afternoon. Finally we enter the pool to commence our confined water training exercises. Generally, 30 minutes later, the person who did not need the bathroom before, now needs a visit. All gear off (this is no quick job for a beginner!) and a couple more will take the opportunity for a pee stop. I once had a Frenchman jump out at this stage too prior to heading in the opposite direction to the bathroom. I promptly reminded him where the bathroom was and he informed me that he was going for a cigarette! I politely told him that he would have to wait! By 17.15 we jump out of the pool, I demonstrate how to strip down gear, wash everything down and put everything away and I fill tanks whilst students shower and change. I finally take everyone home, lock up and head home for 18.30 ready to repeat everything again in the morning. By the end of the second day, all confined water skills are completed, snorkeling and skin diving skills done, there has been time for practice and all knowledge and exams are completed and marked in advance of our 3 day trip to the reef the following day. The Retail shop closes at 20.00 each night and up to this time customers may still book on for the trip the following day. Any late bookings or changes need to be adjusted on my pick up list so I am usually the first to know. The night prior to each trip, I aim for an early night in order to get some well-earned rest for the next three days away. Boat mornings spell an early start for me and, depending on my pick-ups, I am likely to be up and about at 4 o’ something silly. I will make some strong coffee prior to heading off on my customer pick-ups! Once on the boat, roll calls completed, cabins allocated and safety briefings held, I get all my students to set up their gear and brief them on the first dive before it gets too rough. Despite my seasickness warnings, the back deck will soon be green with seasickness! I generally find out that my student who never gets seasick, so took no medication, has only been on a boat once, on a calm lake! The crew will spend the next three hours on back deck, handing out seasickness bags and reminding people to vomit on the leeward side of the boat! The best job in the world! By late morning, we arrive at the reef and the next three days for the dive crew is mapped out with briefings, training dives, guiding, de-briefings, certification ceremony’s, eating, washing up, vacuuming, cleaning toilets, paperwork, moving the boat, mooring up and back deck duties to name but a few. Needless to say, the time flies by! The days end at around 21.00 after tanks are filled following the night dives and the dive deck is secured (deco bar up, tender up, ladder up and so on). I suppose working on a boat, however, you never really do end your day, even after finishing, I am still getting asked “Where is the log sheet?”, “Do we have any band aids?”, “How do I rent a camera?” ….and so on. All the crew get up before the customers to perform duties and I always enjoy the five minutes of no questions prior to passenger wake-up! So, in between all those duties involved in the best job in the world, what is it really like? Well, I suppose you could describe the job as a lifestyle choice and not a job. All the crew do it because we love diving. We certainly do not do it for the money! Perhaps, more importantly, we do it because we have a shared passion for diver training. The rewards offered in seeing students grow into mini versions of you throughout their courses are far more satisfying than any financial gain. You certainly get to do a lot of diving and certify a lot of divers in the process. I often go on crew dives to remind myself why I do this job and try to get out on my weekends to enjoy my diving without being responsible for anyone! That is key to keeping fresh in such a tough environment. I see a lot of burnt out instructors who no longer even seem to like diving and it is because they see it simply as a job. They need to remind themselves of the reason again by diving for pleasure. I have had the pleasure of snorkelling with Dwarf Minke Whales, experienced picture perfect glassed out conditions and visibility, seen turtles mating, humpback whales breaching, sharks hunting, been dragged behind a tender with playful dolphins, built my skills, learnt how to be a deck hand and made some fantastic bonds with crew and passengers alike. I have also seen woeful conditions, been out in cyclones, had bad groups, bolters, whingers and the like. But these bad times are easily forgotten in contrast with the good times and experiences I have had! Indeed, the last three years have been a roller coaster of hard work, fun and valuable experience, I would not have changed it for the world. A very accurate description J9. I can relate to every situation you have mentioned there. However just to add a little contrast I have had many students who were a pleasure to work with. And I’m sure you have too. Cheers Matt… I am nothing but honest! Please don’t get me wrong, the majority of students I have taught have been a pleasure to work with. I have developed deep bonds with many of them and keep in touch with them years on. Quite a few are now instructors too! I just wanted to convey the other side to life as an instructor – the side that is rarely mentioned outside of the staff room! Another great article J9. If I complained about having to get up too early on the OW course, I sincerely apologise! You were an amazing instructor, better than anyone could have hoped for! I imagine if I’d had someone different I might have never got thru my initial hiccups and ended up leaving disappointed too. Bearing in mind all the challenges you face above, you were never caught without a smile during the course. You either have a great deal of tolerence or hide it well! ….Imagine someone holding up the entire class just for a smoke! How rude! Glad you like my article Sean. It’s divers like you that have gone on from their OW course to become passionate divers that continue to inspire me every day. I am privileged to have had the pleasure of playing a part in your diver training. Thanks for your comment. I’d agree that it’s probably not a job for someone in their 50′s. And it’s not a job you do for the money, either! After 3 years working as a full-time dive instructor, I am currently back working in my original line of work in finance, and still working part-time as an instructor. But don’t let that put you off – I wouldn’t change those 3 years for the world. And, like me, you already have a career to fall back on, so what have you got to loose? So, I’d say, go for it. What’s the worst that can happen? You work as a dive instructor for a year or two, if you ‘get it out of your system’ or find you are not earning enough, consider it a career break and fall back into law? Or maybe you’ll live happily ever after as a dive instructor on a tropical island somewhere…? Who knows? The truth is, you won’t know how you feel until you’ve tried it. And if you never try it, you’ll never know. So I’ll leave you with my favourite saying, “Nike!” Just do it! J9 recently posted…Great dive guides – worth their weight in gold! If you ever need a hand for a few weeks, love to see how you do it……. Thanks for your comment. I no longer work on the liveaboard. We are currently based back in Sydney. Where do you work as a Staff Instructor…?